Today (the 29th of September) marks Michaelmas. The Saint day celebrating St Michael defeating the dragon and the archangels in the book on revelation. It also marks the end of the husbandry (agriculture) year- being harvest time. 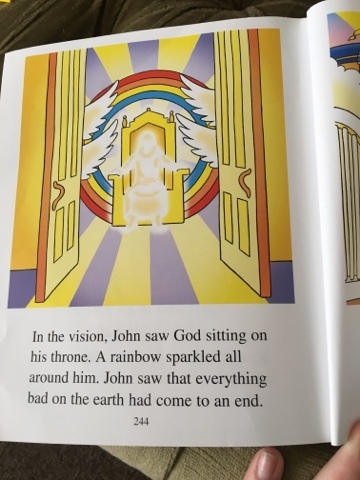 Our circle time this week will feature the reading of revelation from Edwin's Children's bible. O Michael, you, you we await. We follow you, show us the way. 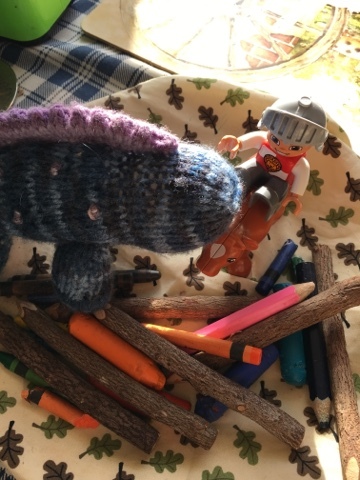 I have repurposed a duplo knight and a knitted lizard to help visually tell the story during the poem, and to set up in the centre of our kitchen table. We also lit our Autumn candle during the poem. I let Edwin blow out the candle to symbolise the slaying of the dragon. 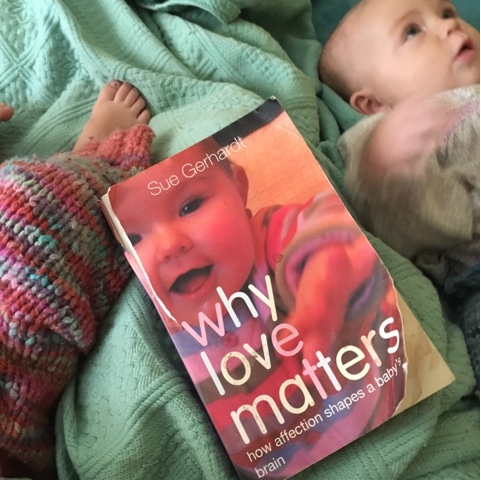 "why love matters" by Sue Gerhadt has been on my reading list for quite awhile now. I often flip through the pages at my mum's house. But it's always seemed very happy and full of psychological research papers so I've kind of put it off until I finish the University work. A few chapters in it's still quite a heavy read. It's been made a little easier as she draws on the work of Bowlby and The Romanian orphanage study to illustrate her points about cortisol development. So far as I can tell it mainly supports the attachment theory, but uses biology and neuroscience to "prove" how important the loving parent child relationship development is. My key take away so far is that once put in a stressfull or scary situation (maybe being scolded or witnessing a parental argument or even road rage!) children can't self regulate themselves back into a safe emotional state. Instead they look to the adults around them. Children who's caregivers don't show them how to calm or help them can will struggle with this later in life. As a hothead (with my husband) I've taken note. Try to be a lot better at expressing myself and being calm. Definitely makes me reassured in my decision not to scold my kids too. 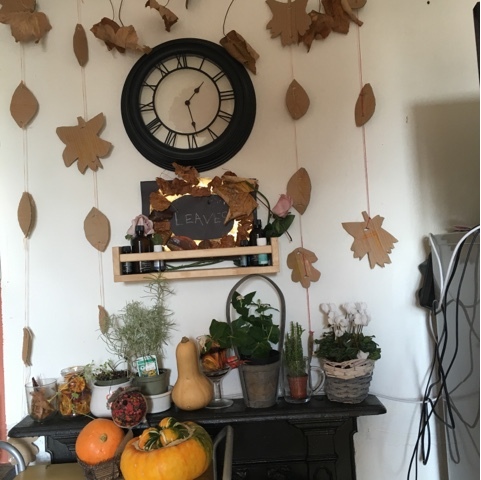 Who else loves Autumn? For me it's a season of new beginnings, change and growth. For me it's actually more exciting than spring, because it's when you get a chance to finally take a step back from your year and evaluate how it's going. Whilst taking stock this year I realised that I'm in a bit of a limbo with my toddler. Edwin has always been precocious and full of energy. But as he gets bigger I'm noticing a stark difference in his temperament to that of his peers. In toddler groups and even the Waldorf class we attended, the rigidity of their set ups seem to be an affront on his scientist/explorer learning style. Sometimes when a group is particularly busy or feature a prominent change, he goes into absolute shut down and runs. He's not dominant in nature, but is very hard to encourage to participate in group or structured activities. Basically all of my heart is telling me that a standard preschool or kindergarten would be so the wrong place for him. I have nightmares of my gentle and kind people pleaser being labelled as naughty. Being forced to "behave" when all he wants is to be free and play. As a student of psychology I've taken a keen interest in how we learn, and basically our perception of how well we can learn from this early age has a marked impact on how we go forward academically. But also, more importantly you have to enjoy it, to learn well. I don't believe any child forced to follow a strict structure, when they are not ready to do so, will enjoy learning. I've raised my concerns to my health visitor, but basically until they convince me otherwise it looks like Edwin will be home preschooled. What an interesting Autumn it will be! If you are anticipating full of downton Abbey inspired wardrobe loveliness, let me break it to you gently, this isn't a post about vintage dressing. This is a post about vintage shopping. Back in the 30's the average woman owned 9 outfits. Fast forward we now have approximately 30 outfits hanging in our wardrobe at any time. I've been gradually clearing my clothing collection. As someone who used to work in fashion there are a few items of clothing that have sentimental reasons for keep in them. Like the shirt that I designed, or my crazy full flare Dolce and Gabbana leopard print flares that I have only worn once. It's tough the idea of letting go of anything that has sentimental attachment. But as any mum will tell you getting dressed in the morning is tough. Most of the time I found myself either grabbing the same two things anyway, or wearing something I didn't feel comfortable in. Why was I holding on to all of these clothes? So last week the charity shop received a bumper donation. I've completely culled back my wardrobe. Or a grand total of 8 "outfits"
Hurrah! 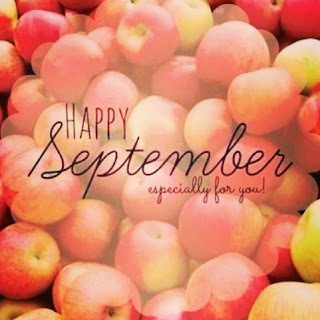 It's September, I love the all changes of season but summer to autumn is probably my favourite. On the allotment there's plenty of food for us to harvest, but no yucky digging. Meaning I can easily take the kids down on my own. Mainly its all picking crops and a little weeding. I've got crops in pots (fennel, leeks, chicory) ready to go in the ground when I pull up my summer marrows. In between rows of slower growing plants like Kale, purple sprouting, carrots and cauliflower, I planted (in august) fast crops of baby turnips, baby beetroots and kohl rabi. 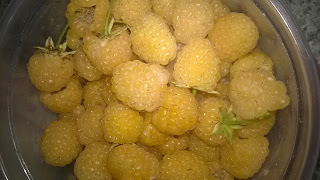 I've been pulling these up a handful at a time, in a kind of staggered thinning out of crops style to make the harvest last longer without having to preserve it yet. We've been using a lot of the veggies for the pub. So I'm down there twice a week picking crops and once a week weeding and pottering. Little miss M loves being outside. I'm flabbergasted when I compare how she is as a baby compared to froggy. He hated to sit still, always wanted to be carried or on the move. 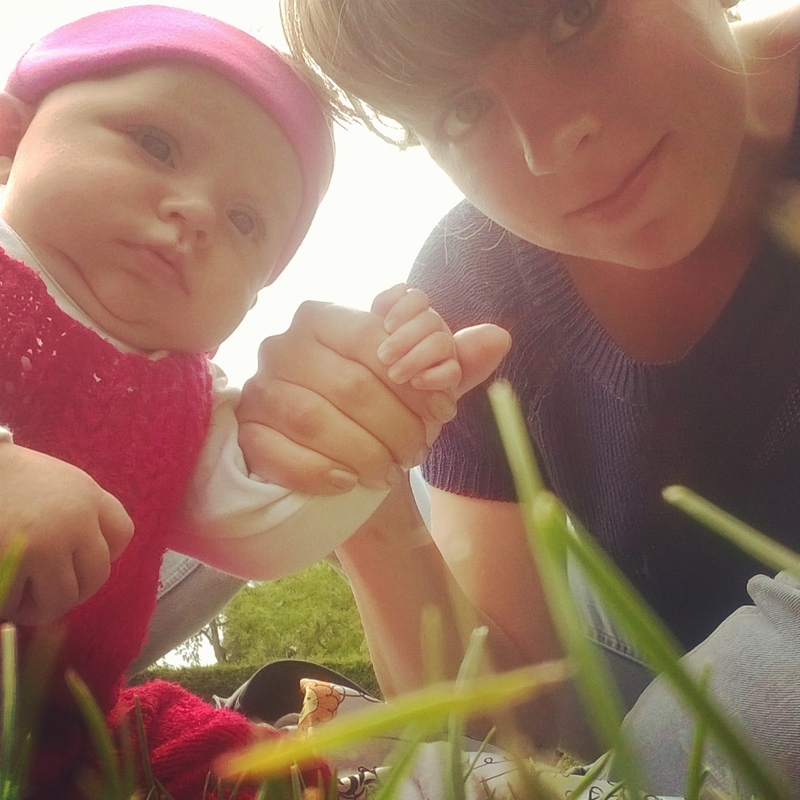 But my baby M, she's an observer, quite happy in the pushchair or the bouncer down the allotment. Making all the hoeing and harvesting a lot easier on my back. She just coo's at the flowers, a true free range kid. 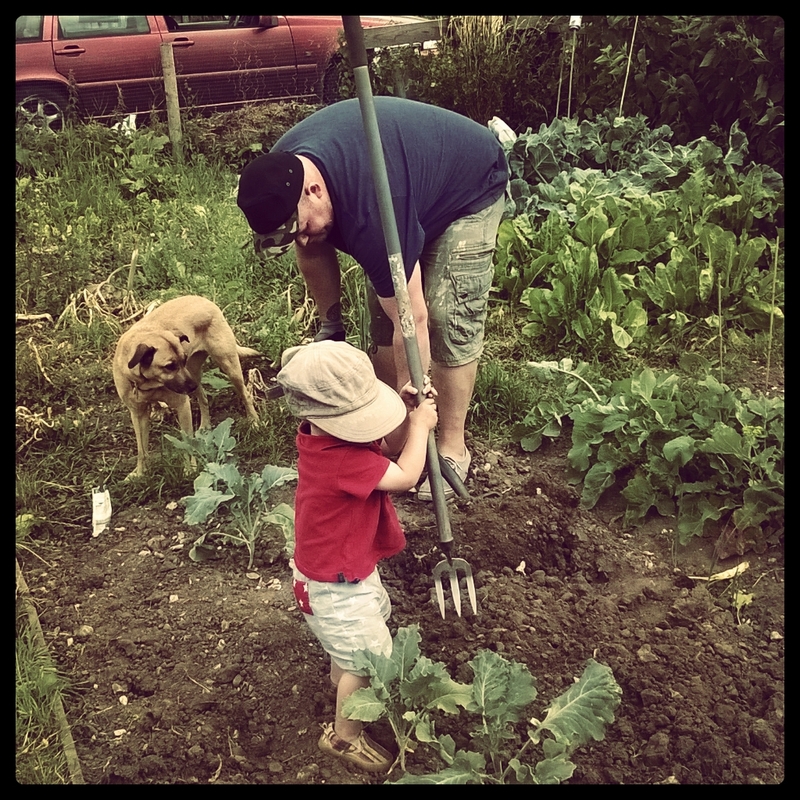 At two froggy is finally a willing allotmenteer. He's not running off (so much) and can put some of his beautiful energy into digging or eating berries. 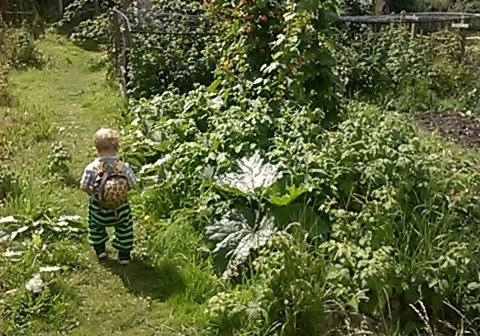 Which given his strong urge to run off from the crowd at play groups and mothers coffee mornings, bizarrely makes the prospect of being down the allotment a lot more calming! 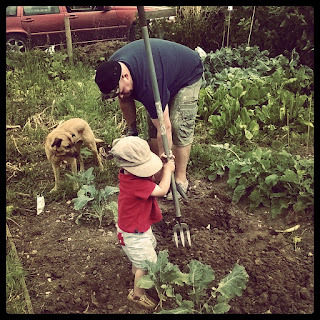 This month, I'm focussing frogs homeschool (or home preschool) around the theme of seeds and harvest. So the allotment has been a valuable resource. We've just sown the last of the pea's and beans for this year. Along with salad crops in the pub vegetable beds. I'm not sure if they will crop before the frost. 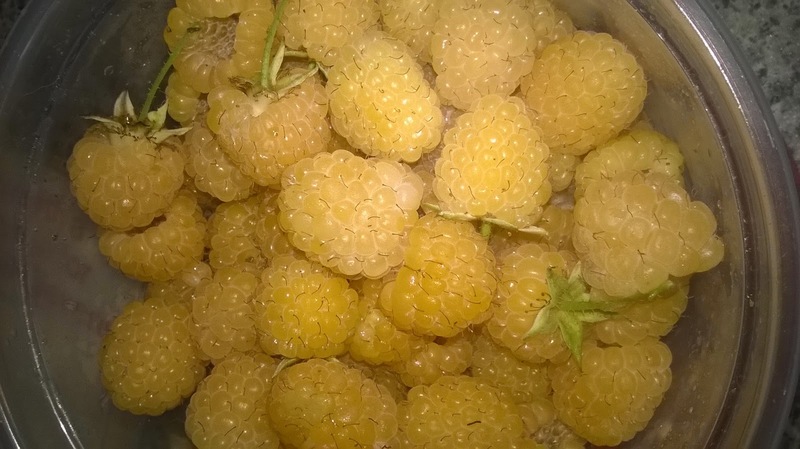 But other homesteader mum blogs lead me to feel hopeful.